I decided that if fall is here we might as well embrace it. So out came the pumpkins and the Halloween decorations this afternoon. 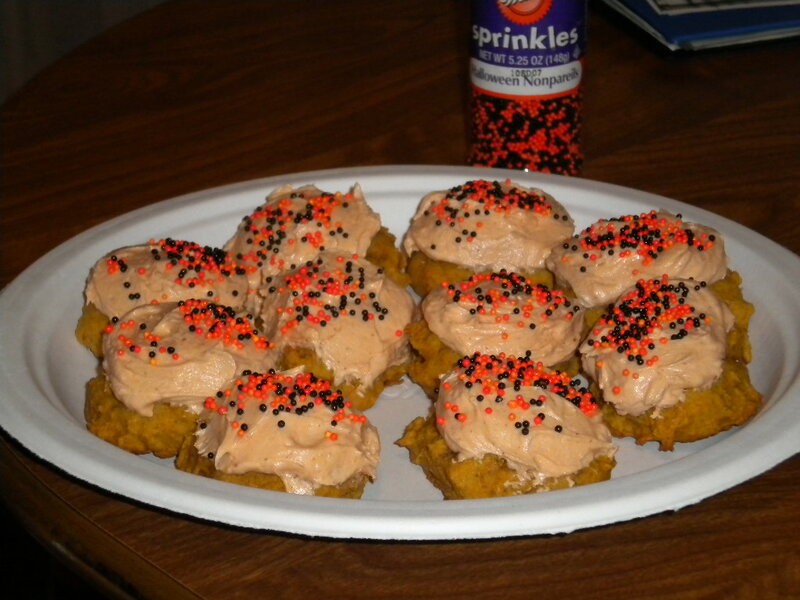 I also decided that it was time to bake my favorite pumpkin cookies and share that recipe here. The original source is the Fargo Forum newspaper, and I haven’t found anyone who doesn’t love the fall flavors. The recipe is below. Two comments about the overall experience of the cookies are in order. First, they are closer to cake bites than cookies. They don’t spread at all while baking, so pay attention to how you drop the dough on the baking sheets. Second, they might look a bit similar to the pumpkin cookies you can pick up at Giant Eagle these days, but they are SO much better. If nothing else, the maple syrup in the frosting gives them a whole different flavor. I promise at least one more post from me this week, because the butternut squash from Matt is calling from the kitchen to be made into my favorite fall soup. I hope everyone is having a good weekend, despite the awful weather. Mix the dry ingredients in a small bowl. Combine the shortening and brown sugar, beating for a full minute. Add the pumpkin, egg, and vanilla; mix until well combined. Add the dry ingredients and mix well. Drop dough by mounded tablespoons. Bake at 350 for 14 minutes. Beat the first five ingredients and add the powdered sugar gradually and then the food coloring, beating well until fluffy and with uniform color. This entry was posted in Dessert, Recipe on October 1, 2011 by theneighborboys. We moved into a new home that we loved only to discover that among its best features were the neighbors. This summer, we're on a culinary adventure with our new extended family as we all enjoy the harvest from a local CSA. Those cookies look so GOOD and festive! I am not big on baking, but I am going to try this recipe. I love pumpkin flavors and these would be so good with a hot cup of coffee. Yummy! You’ll love them. I hve already had about a dozen of them from last night to this morning…..I have a love hate relationship with these fantastic treats Tom makes! Love eating them…hate feeling the hmmmmm, maybe I should put the tenth cookie down haha. Kim and I have been fortunate enough to have eaten these warm from Tom and Jeff’s oven. They are so delicious- and the maple in the icing brings them to the next level of goooey goodness! Sadly, I have a little sore throat and didn’t make it to the market. It’s the only one I missed since we were in Chautauqua! Next weekend will be beautiful though, I know it! 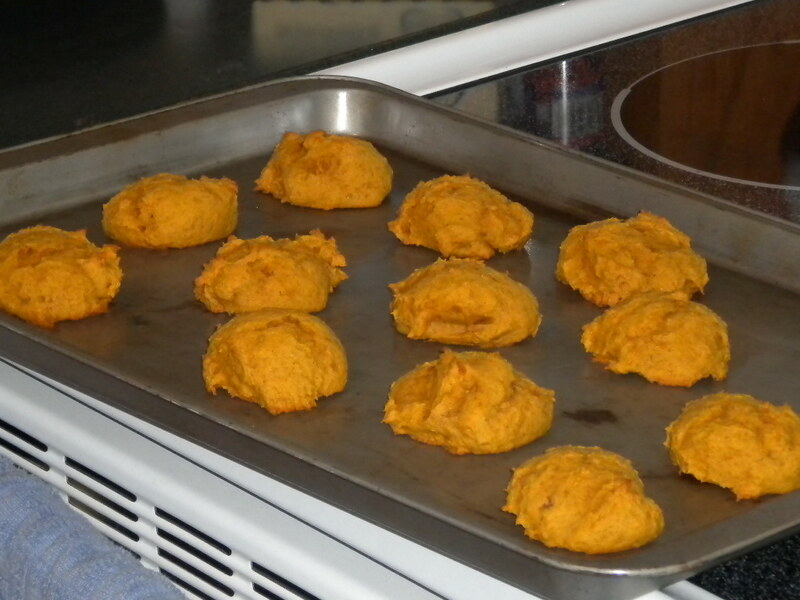 I tried to make pumpkin cookies on Friday, but they came out more like pumpkin muffins. Still delicious though! Laura – Your comment just makes me want to try putting the same batter in muffin cups next time I make it. I can imagine swapping out the frosting for a cream-cheese based icing or a simple syrup glaze instead. Would that make them muffins or cupcakes? They’d definitely be yummy, though, I think!